This is a request I’m asked all the time, help me get organized at home. While it seems simple, in truth it is just a starting place, a call for help and not knowing where to turn or what to do. Organizing is more than just buying a few storage bins and a planner, you actually have to work towards getting organized, it won’t happen overnight. There are systems that you need to decide and work, it takes time, patience and a desire to change to succeed in being organized at home. It sounds complicated and difficult, but that isn’t true; it is just the act of changing the way you do things and fighting that desire to let things slip backward. Yes, there are days when things aren’t as easy as you might hope but change takes time and there are good days and bad days. It is about moving forward and forgetting mistakes that have happened in your past, a new day and a new start. Understanding what you want is the most important step you can take, some people organize everything to the last detail, this might be too much and you might just want to organize your time better. When you have the idea of what you want the final picture to look like, only then you can take the steps to put actions into place to accomplish your ideal. If you don’t know what you are looking for then it is very difficult to put steps into place, because you might be looking in the wrong direction for you. What do you think an organized home should look like? How do you think organizing your home will help? It is about understanding what you want that will help you decide what is right for you and your family at this time. This picture will probably change in the future, but that is OK, you then just adjust how you organize your home and family life with the changes. I think it is important to think about what you want in your future, it gives you time to take action, plan things into your day that will help you reach your goals and your dreams. Often organizing will take time, it is not something that will happen overnight, you and your family have to adjust to new systems slowly and this means not overwhelming them with too many changes at once. Doing too much and expecting everyone to change then it is likely to fail, it takes about 3 weeks for an activity to become a habit and the more you try to fit into that 3 weeks the likelihood of habits not forming and you dropping a few, increases. Therefore, the longer you take to organize your home the better chances you have for the habits to stick and you to have a more organized home. If you are wanting to get organized at home then the best thing to start with is planning, it doesn’t matter if you work, or stay at home, the more you can plan the easier your day will be. You can do so much more if you can plan, it doesn’t matter your age or your lifestyle, and your only restrictions on what you can achieve are you. I am a firm believer in setting goals and living and taking steps towards my goals, it doesn’t matter how old I am if I want something, the only person who is going to make that happen is me; it might take some hard work but I know that I have taken the right steps towards my goals and dreams. If you want to have a more organized home, the first step you need to take is to plan what you need to do. Make sure you make realistic plans, ones that will actually work. You want to succeed and to repeat those actions that make you feel proud of success. Learning to plan your day successfully isn’t always easy, it takes time to learn how to plan your time, to ensure that you are giving yourself time to do the tasks and to get to appointments on time. If you spend a month or more on learning to plan you will naturally become more organized in the tasks that you do and the way you head towards your dreams. While it seems odd to mention that you must learn to plan and to live your dreams, it is also important to focus more on the now. You can dream big and then not take action, so your dreams will fail. You need to focus on the now, but use this to work towards your future. There are times when it seems counterproductive, with doing some things if, in the future, they mightn’t be part of your dreams. However, you have to work hard, nothing happens by chance and the things you do now will have an impact on how you shape your future. Therefore, if you want to get organized at home it is going to take time, there is not a quick fix that will suddenly make your home and life organized. It takes commitment to continue to work your systems until they form part of your everyday life. There is frustration in your future too when something doesn’t happen or something stops working. It is though becoming organized is testing your desires that this is truly what you want; however, if you put in the work, the time and the effort it is all worth the end results in having a more organized home and life. What is your best tip to help others to get organized at home? 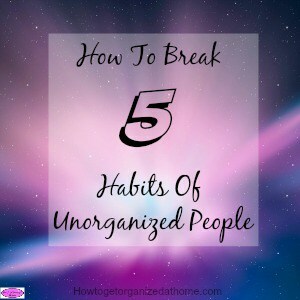 I wrote another article I think you will like, How To Break 5 Habits Of Unorganized People.